Brace yourselves for another warm summer in southern California, and head towards the beautiful Laguna Beach for a mixture of food and sunny fun. The beaches are already bustling these days as people flock to the sand, with many opting to stay ocean-side at one of multiple resorts in the area. 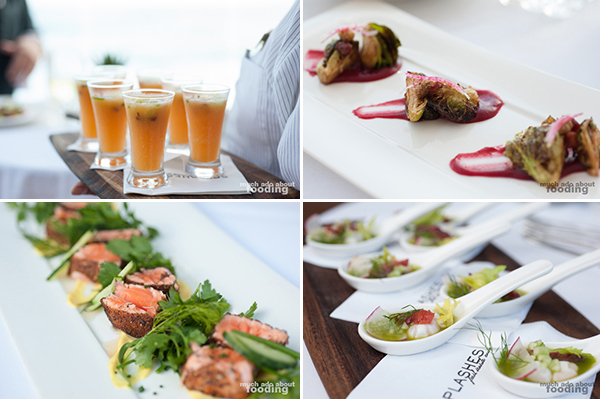 Surf and Sand Resort is definitely experiencing their busy season now, and with a full-fledged bright summer menu, their resident restaurant, Splashes, is hustling under the direction of Executive Chef Ron Fougeray who brings creative combinations to the table. I got to take a few bites from the season's menu which highlights the great seafood we can get here in Orange County and pairs well with a glorious beach view. Chef Fougeray came to Splashes not long ago, having previously been at 32-seater Biyou BYOB in Philadelphia where he worked from 2009 with Owner/Chef Pierre Calmels to the esteemed position of Executive Chef by 2013. A graduate from the Johnson & Wales University in the Culinary Arts Program, Fougeray learned most of his working craft through his seven-year experience at Georges Perrier's Le Bec-Fin, a renowned award-winning fine dining restaurant, and proudly claims how much he uses the techniques learned there today. "I loved the challenge when I came in. If I could do 90 covers with three people, I could do 300 with six people. I'm really lucky here to have an amazing management and kitchen staff; I work side-by-side with them and am not the kind of chef to waltz around with a clipboard. I like to cook and work to make a family there in the kitchen." The move to Orange County landed him in Laguna Beach at Splashes where instead of taking care of under 100 covers in one night, he now deals with 220 in the restaurant, 100 at the bar, and 100 for room service during dinner hours alone (Splashes does breakfast, lunch, and dinner). It keeps the chef busy but also on his toes and constantly creating. Fougeray attempts to source locally whenever possible, particularly with seafood and ensuring it is viable through the Monterey Bay Seafood Watch program. Seasonality keeps the menu changing as well and in particular, this summer menu was all about "light, bright flavors and herbs." He really meant it when he emphasized light and bright. 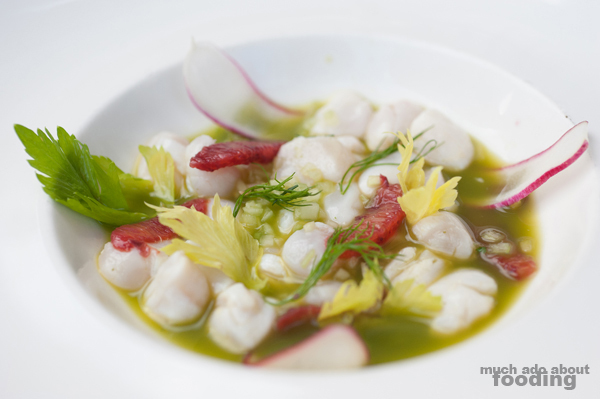 If you are craving some seafood, you might want to jump on the Bay Scallop Ceviche ($17 - verde jus, citrus supreme, radish, cucumber dice, dill, and celery leaves), a refreshing appetizer that highlights the freshness of the scallops in play with tart citrus. Including shaved radish and diced cucumber gave the dish an overall balance in texture between soft and crisp. To not forget us soup lovers, Splashes does have one on their summer menu but not quite the steamy hot bowl you might initially have thought of. A gazpacho for the summer weather is in place with some table-side interaction when it is brought out. 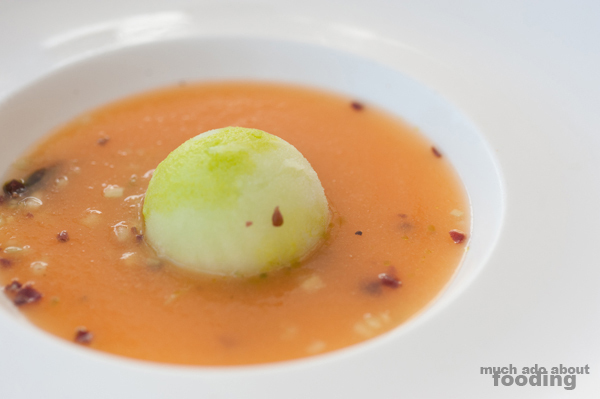 The Chilled Cantaloupe Soup ($15 - honeydew & cucumber sorbet, duck prosciutto, and mint oil) is poured around a perfect sphere of melon sorbet and colorfully embodies the playfulness of summer. 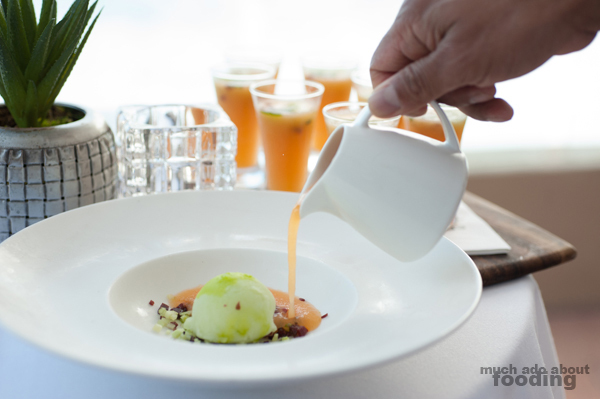 Fougeray marinates his cantaloupe with serrano, basil, lemongrass, ginger, shallots, cilantro, and white wine overnight to enrich its already sweet disposition and pairs it in classically with prosciutto in a non-traditional way. I loved the combinations of flavors. A hit with the group that evening was the Ahi Tuna Crudo ($19 - jicama, raspberry vinegar, mustard oil, cucumber ribbons, cured black olives, and avocado mousse) for its hearty cubes of ahi and the balance in flavors from the creamy avocado mousse to the tang of Sicilian cured olives to the slight bitterness of young mustard green leaves on top. 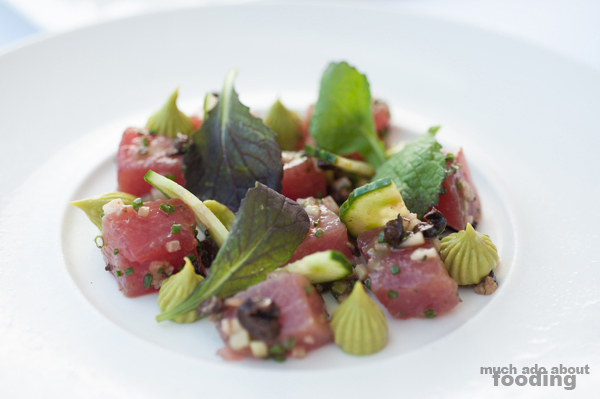 Considering how enamored Orange County has been with ahi poke later, I would expect that many would prefer this dish to be more bounteous but hey, you'll get the beach view with your plate! There is a riff on the beloved ubiquitous brussels sprouts side dish that it seems almost every restaurant now carries. 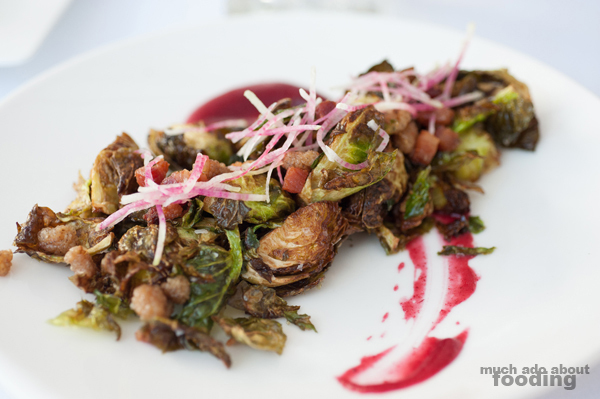 Splashes does their Brussels Sprouts ($17 - cranberry purée, lardons, dried mulberries, and watermelon radish julienne) with the season in mind and gravitates toward lightening the flavors via berries. The colors also popped with each ingredient, making it a composition of both visual aesthetic and tastiness. The other savory bite we had was one not on the menu but inspired by a recent training Fougeray attended in France. 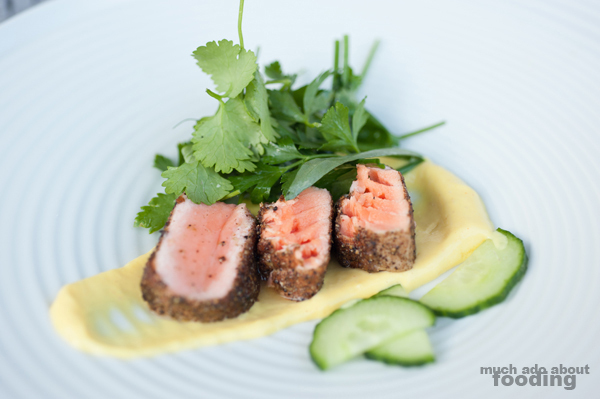 Delicate morsels of brilliantly-pink salmon were rubbed with espresso grounds and five types of peppercorns before being seared and served atop a mango coulis containing mustard oil and fat-free Greek yogurt. A fresh herb salad of cilantro, tarragon, chives, and parsley accompanied the dish along with thin half-moons of cucumber. The fish was quite soft and juicy, flavored well and presented beautifully. It was unanimously said that this salmon dish had to be on the menu soon. 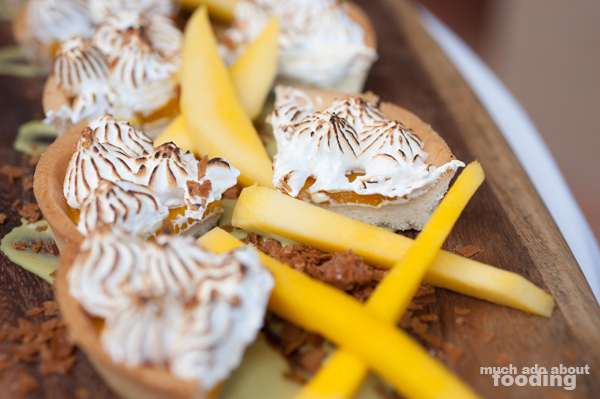 To round out the courses, we ended on their Mango Meringue Tart ($13 - green tea crème anglaise), a dessert made completely in-house from the mango puree to the anglaise to the Swiss meringue on top to the praline crumble bottom to the mango curd in the middle. I had to point out every component because each one really proved its worth in every bite and stood its ground in the overall combination. I liked how it wasn't too sweet a dessert and easily one that could make a lot of mouths happy. 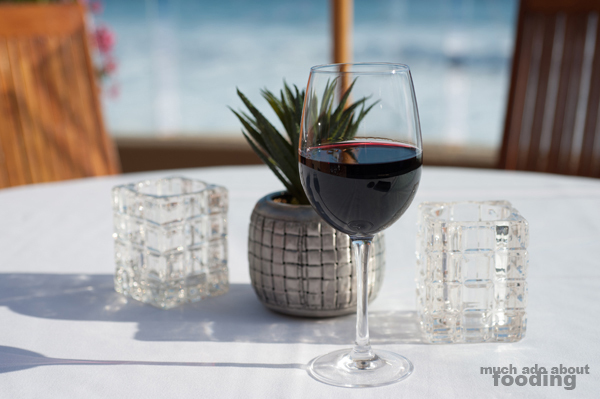 If you've been tempted by the dishes I've mentioned above, you can find the Surf and Sand Resort at 1555 South Coast Highway, Laguna Beach, CA 92651 where Splashes is located. If you're out on the beach there and not wanting to dine directly in the restaurant itself, you could also order some of their dishes from the shore itself such as flatbreads and burgers!